Availability for flight lessons continues to increase higher than ever before as our team sees more growth. 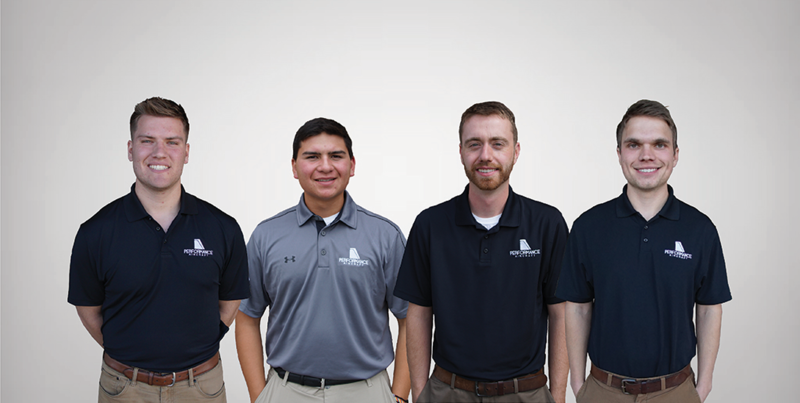 We’re happy to highlight four new flight-training-focused employees: three flight instructors and one support staff member. Trent Matthes (far right) grew up on an acreage south of Lincoln near Panama. Trent was previously a Performance Aircraft student and received his private pilot certificate from Performance in 2016. He continued training at the University of Nebraska at Omaha, where he started an aviation degree and received his instrument, commercial, and CFI ratings. In May, he’ll be graduating with a degree in aviation and a concentration in professional flight. To round out his experience, he’s also flown over 300 hours for a few aerial photography operations. Originally from Sioux Falls, South Dakota, Matthew Gabel (far left) moved to Lincoln and joined the Performance Aircraft team in December. He has always had a passion for aviation from a very young age, since before he can remember. Matt now holds his commercial pilot single-engine and multi-engine certificates with an instrument rating, as well as an MEI and CFI rating with a CFII rating to come in the near future. He is quite excited to light the same fire he has for flying in others. Tom Arington (right center) joined our team in September as the assistant chief flight instructor. Tom began working on his private license in high school. He completed his certificate just prior to enrolling in the professional flight program at the University of Nebraska at Omaha. He earned his flight instructor certificate in the fall of 2015 and went on to give over 900 hours of flight instruction over the course of the next two years. He graduated from UNO’s program, and in early 2018 he left flight instructing and worked as the FBO manager at SkyWerx Aviation. Driven by his passion for teaching, Tom is happy to return to flight instruction. Our new flight training support assistant, Kyle Soto (left center), joined us in the fall. He simply loves the feeling of being in the air and will soon start training for this private pilot’s license with Performance Aircraft. Kyle is working hard toward his life-long dream of becoming an airline pilot, even as a sophomore in high school. He plans to pursue a college degree in aeronautical engineering or aerospace engineering and eventually pilot long-haul, international flights on the Boeing 777. With the steady addition of employees, we’re looking forward to having expanded office space upon the completion of our new building in the next few months. Construction is moving ahead during the winter months, and the metal frame is now partially in place. Progress can be seen week by week. We’re excited to have a fresh new home for all of our new instructors and aircraft fleet, as well as improved study and testing space for our customers.